2012’s Nobel Prize in Physics goes to Serge Haroche of France and American David Wineland. They showed in the 1990s how to observe individual particles while preserving their bizarre quantum properties, something that scientists had struggled to do before. While this contribution may first seem far-fetching and remotely detached from the daily management challenges of a business executive, I am going to argue otherwise. Let me first touch on the significance of this discovery. At the beginning of last century when quantum physics was born, physicists have discovered that classical laws of physics break down at sub-atomic level. Everyday objects that we are used to have deterministic states. For example, given the starting location and the velocity of a car, we can easily determine its location at any time. Tiny particles on the other hand behave differently. The foundation of quantum mechanics was first built on the Heisenberg’s principle of uncertainty, which describes the possibility of physical objects having multiple states. Hence given the initial location and velocity of a particle, multiple locations described by probability functions are possible. 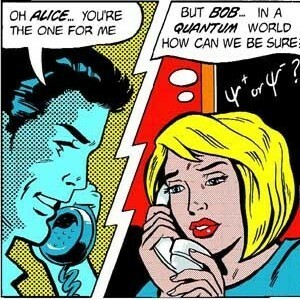 This is what makes quantum mechanics such a bizarre subject for most people. Making things worse, it was not possible to observe this type of behavior. For example, observing a photon will require lights to be absorbed by our eyes or any image sensors, hence altering the state of the photon itself. This observer effect and uncertainty relation has been captured in many ways in philosophical studies such as those of Karl Popper and reflexivity. The latter one has been mentioned by George Soros as the principle behind his investment strategy. Working around these monumental theoretical and philosophical hurdles is hence what the 2 Nobel literates have achieved. What Can Managers Learn From Quantum Physicists? While the bizarre world of quantum mechanics may seem distant, the principle of uncertainty for tiny objects prevails well in business management. For example, many companies have installed some type of ERP systems to get a real time view of the state of their business. There is a strong belief in the existence of a single version of the truth on financial data that are at company or division levels. Day-to-day decisions are made based on this information. This is almost in analogy to management by classical physics. However, when it comes down to highly granular information like events on critical machines, individual operator performance, inventory by SKU and bin locations, or even OEE for machines, business executives tend to think of them as the world of tiny objects like the bizarre world of quantum mechanics. It is not uncommon to have multiple truths in such manufacturing operations. The reported OEEs from different plants for the same type of machine can be based on very different measurement methods and subject to different degree of human errors. Different departments on the manufacturing shop floor have different recognition of the true state of their operations. The variable cost by product line by shift can be far from the aggregate cost that was captured in ERP. The inventory accuracy by SKU quantity can be way below the ERP inventory accuracy that is based on total aggregated financial numbers. It is far too common that business executives have admitted the principle of uncertainty and allowed their manufacturing operations to operate based on multiple uncertain states. It does not have to be that way. Just like the Nobel Prize winners have discovered, the technology to observe and measure the quantum bit of manufacturing information exists. Some companies have already tapped into the power of this technology and achieved significant improvement in profit margins and working capital. In the increasingly complex and turbulent world, tiny quantum bit of information can explode into a perfect storm in a very short time. The capability of a business to leverage these quantum bits is already distinguishing the winners from the losers in the marketplace. While the technology to observe the quantum bits of manufacturing information may be a far cry from getting its own Nobel Prize, the application of such technology should not be left as a subject of uncertainty anymore.